CINCINNATI (CNS) -- Ten inmates at Lebanon Correctional Institution north of Cincinnati experienced the sense of hope and promise of new life that accompanies the Easter season when they were welcomed into the Catholic Church March 23. Archbishop Daniel E. Pilarczyk of Cincinnati celebrated an Easter Mass at the prison during which the men received the sacraments of initiation. Since last fall, they have been part of the Rite of Christian Initiation of Adults, along with their sponsors, many of whom are also incarcerated at Lebanon, a state prison known as a "close-security" facility, which is one step down from maximum security. The men wrote letters to Archbishop Pilarczyk petitioning him to celebrate an Easter Mass at the prison and confer the sacraments, and along with the volunteers and Lebanon staff they were thrilled to welcome him. It seems with all the negativity in the news, especially where religion is concerned, that a story emphasizing hope will make for an appropriate Easter season reflection. I don't believe that it is unusual for the incarcerated to get religion, though probably there is less to doubt about jailhouse conversions than skeptics would have us believe. Often what it takes to find God is to lose everything else. It's the way of conversion that the majority of us will--quite thankfully--never have to know. Still, conversion entails surrender and certainly some situations lend themselves to it much easier than others. In many ways I believe that prison conversion has much the same to do with discovering the power of God as does finding God through recovery from addiction. I have had many people tell me that it was necessary for them to bottom out entirely before finding the power to be healed. Indeed conversion is all about healing, though perhaps not in the way that inmates or alcoholics or addicts might understand healing--or even those who have chronic illnesses. It's a common experience among us that we need to be healed in the area of relationships. I've given thought to this recently, and I believe that we do a lot for others, in terms of sharing the love of God, when we work to facilitate healing in the area of relationships. I'm no relationships guru, so I don't have the answers or advice that can make things right. In fixing your relationship I'd likely fail if I attempted it alone. I'm sort of a team player in it (that's me in outfield), and really all that I've learned is that someone has to take the initiative and offer reconciliation. I keep in mind the words of a sermon I heard when I was 12 years old. The preacher said that compromise is the key ingredient of good relationships. I've kept that close to my heart all these years. It may not look like it at first glance, but the prisoners in the story above are healing relationships. In a similar manner when you and I go to confession or receive Eucharist, we too are healing relationships. In a wedding homily recently I said that the sacramental marriage has the power to restore friendship with God, and the reality of that too gets its meaning from the involvement of people in each others lives. Hope is where I started today, and hope where I want to end. On the surface of things we may not see much hope, but we must be believers. Now, like any good teacher I'll give a homework assignment: offer reconciliation to someone, either directly or indirectly--play outfield if you'd like--but be sincere in offering an overture of love. NB-I'd like to thank Sister Eileen Connelly, who wrote the excerpt quoted above from CNS. Though she may never set eyes on this blog, her overture should not go unrecognized. A simple prayer goes a long way. As the story below states, the acts of vandalism described therein are "not yet being treated as a hate crime" although the slurs left behind by the offenders clearly reveal their sentiment. A 63-year-old Virgin Mary statue was one of two religious monuments vandalized outside a Catholic church in the Heights during Holy Week. In one case, vandals also spray-painted a religious slur on church property. The incidents, which occurred during services on Palm Sunday and Easter Sunday at All Saints Catholic Church, 201 E. 10th, are being investigated by the Houston Police Department's burglary and theft unit. Police spokesman Sgt. Gabe Ortiz said it is not known whether the incidents were related. He said they are not yet being treated as a hate crime, but officers are trying to determine whether people were specifically targeted because of their religion. Regardless, the vandalism has outraged members of the 100-year-old All Saints parish. "Everybody is so angry," said pastoral assistant Cary Ann Nunn. "It is very hurtful." Parishioners noticed the first incident after the 12:30 p.m. Mass on March 16. 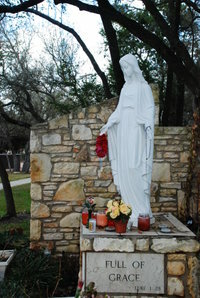 A statue dedicated to Our Lady of Lourdes and displayed in a parish grotto since 1945 was pulled from its pedestal during the service. Nunn said the 4-foot-tall marble statue was knocked to the ground and likely struck with an object. Fingers and part of the face and back were missing, she said. The grotto, which was dedicated to veterans of World War II and is closed for renovation celebrating the parish's centennial, is in the front of the church, Nunn said. Worshippers are using a parish hall in the rear. After the vandalism, All Saints pastor Monsignor Adam McClosky had the Lourdes statue stored to await a costly restoration, Nunn said. It was replaced with a 3-foot-tall statue of the Lady of Guadalupe. During the Easter sunrise Mass at 6:30 a.m., the Guadalupe statue was placed on its head and streaked with black paint, Nunn said. In the Easter incident, a slur was spray-painted on a wall that is part of a handicap ramp. "Don't let them worship idols," was painted in black. In red were painted the words, "You are warned." Nunn said Catholics believe there is a heaven that is peopled with Mary and known saints. Catholics often pray to saints to intercede with Jesus on their behalf. "We don't worship idols at all," said Nunn. "It is like a picture of your mother." The story reminds me of years ago at the parish where I went though the RCIA that a new statue of St. Francis of Assisi was vandalized almost as soon as it was erected. Outside of acts of the mentally deranged, it was my first real exposure to vandalism against the Church. I wondered at the time whether it was a juvenile prank or if something else was going on. Since then I've come to know that hate can be the real inspiration for such actions. Certainly hatred and ignorance are revealed in the spray-painted slur, but there is also something else revealed--a prevalent attitude perhaps--in the hesitation of the local authorities to see the act as a crime of hate. Hatred and violence will continue to exist for as long as they are overlooked or tolerated as being something other than what they actually are. For the most special three days of the year. Consider its special contemplative giftedness. Desires for us to open our hearts to his voice. Affirmatively in a truly knowing manner. Wednesday arrives amid the busyness of the week. Moment to anticipate the great Triduum. London, Mar 17, 2008 / 01:21 pm (CNA).- The BBC of London is set to air a mini-series on the last week of the life of Christ which will exonerate Judas, Pontius Pilate and Caiaphas of responsibility for the death of Jesus. The series presents a Judas who anguishes over his loyalties to Jesus and to Caiaphas and a Pilate who struggles to manage his wife’s social aspirations and his career while trying to keep a lid on tensions in Jerusalem. Nigel Stafford-Clark, who produced the BBC series, said he wanted to put the characters’ actions in context “so you can see it from their point of view and realize that what they did felt legitimate”. In an interview with the Radio Times, Stafford-Clark said, "By such accounts as there are from the time, Caiaphas was reckoned to be a fair man and a good high priest. [He was] a man doing a very difficult job and doing it well." A BBC spokesman said, "We are not seeking to subvert or rewrite the Gospel narrative – we are just retelling it to bring it alive for a contemporary audience." This comes as no real surprise from the BBC--they're not seeking to subvert or rewrite, just to make a quid. However I have my doubts that exonerating Judas, Pilate, and Caiaphas will bring much alive for contemporary audiences, or make much money either. Palm Sunday arrived with a sense of excitement and with the liturgical innovation that I have come to expect from my parish at this time each year. Always, it seems, there is something special to reflect upon as Holy Week begins. In many ways I expected that today's liturgy would speak to me personally as we processed with palms in hand, singing praises, while meandering through the parish parking lot, up the wooded pathway, past the Marian shrine, and then back into the church. I was not disappointed in any way with the liturgy though it was not the procession itself that held the greatest inspiration. Over the years I have come to see many affirmations of my faith unfold through parish life, all of which I accept as signs given to me by the Holy Spirit. Probably the greatest of these affirmations is my diaconal ministry itself—the call to ministry—as I recollect on the many special "words" from God in which I hear in my soul, "All is well." Over the years there have been many "all is well" moments. Fourteen years ago I had just moved to Austin. I had been married for only a little more than a year and I had been a Catholic for just three years. After a month or so in town I decided to go for a drive one morning to explore the area. I drove to the furthest suburban neighborhoods of Austin and found the parish that I would eventually call home—where I would eventually live only a few minutes away. That morning, fourteen years ago, I walked up the wooded pathway from the parking lot and I found the Marian shrine. It was the perfect location to pause and pray. In my prayer I thanked God for helping me find such a beautiful place, and I came away with a sense of affirmation that I had been brought to where I was, although I had no idea how things would eventually unfold—but I sensed it deeply. Recently I have been impressed with the sense of God's communication that does not need words but nevertheless requires a soul willing to hear and a vessel willing to hold what God wants to pour into it. Often when God speaks to us we hear incrementally, only realizing some time later the fullest impact of what has been imparted to us. Undoubtedly I know that such communication has been occurring in my life and the content of it centers on what we do at the altar. For many months I have felt the Holy Spirit communicating—though without words—the special sacredness and sense of reverence belonging to the Eucharistic celebration. For me it has come as a power that literally puts me on my knees in the presence of the Blessed Sacrament. Undoubtedly, the affirmation has to do with being in the presence of Christ actually. Somehow, I sense there is more to be said that is yet to come. As the final Sunday liturgy ended yesterday, and—though in a way not typical to our ordinary way of ending the Mass—as I knelt, ad orientem, along with the priest and altar servers, I had yet another moment of affirmation. There in front of me was the altar. Nothing else really seemed to matter, just that which was only a few inches away. As we sang refrains of "Where you there when they crucified my Lord" the moment of greatest inspiration came. I stared intently at the altar, at the little sea-shell indentations in the stone, at the light from the candles illuminating the ivory linen cloth. Not in a million lifetimes would have dreamed that I would kneel so close to the altar of God while a church full of worshiping souls prayed along. Indeed God brings us along the way to where we are and continues to lead us along the path of life. Exactly where things will end up, who is to say? The most important thing perhaps to keep in mind is that God is in control always, still showing the way, still communicating to us. He lets us know that everything has only just begun. Perhaps the best way to begin Holy Week is simply to allow all to be well with your soul and rest in the knowledge of God's nearness, and in his many affirmations. DOHA, Qatar (AP) — This tiny, wealthy Arab Gulf country is opening its first Roman Catholic church, ending decades of clandestine worship for tens of thousands of foreign workers. The consecration of the Church of Our Lady of the Rosary, planned for Saturday, appears to be a sign of Qatar's efforts to open up to the West as it seeks a bid for the Olympic Games in 2016. Qatar's ruler has also approved five churches for other Christian denominations, all under construction next to the Catholic one. Attracted by a booming oil economy, expatriate workers make up at least 70 percent of Qatar's population of about 1 million. Some 150,000 Christians of all denominations live here, over 90 percent of them Catholic expatriate workers from the Philippines and other Asian nations, Christian community representatives said. Qatar follows the rigorous Wahhabi teachings of Sunni Islam, and like neighboring Saudi Arabia had not previously authorized Christians to practice their faith openly. But a priest had operated in Qatar since the 1960s without official approval, said Archbishop Paul Hinder, the Apostolic Vicar of Arabia and the top Roman Catholic cleric in the region. "Catholics in Doha finally have their home where they can gather in freedom and security," Hinder said by telephone from his base in Abu Dhabi, United Arab Emirates. Qatar's emir, Sheik Hamad bin Khalifa Al Thani, personally donated the land to build the $15 million church with 2,700 seats in the outskirts of the capital, Doha, church officials said. Out of respect for local sensitivities, the church will not feature any religious symbols — neither a cross or a bell tower — that would identify the building as a place of Christian worship. "The opening of the church is an important event for the entire community," said Tomasito Veneracion, the priest for the new parish. "We are grateful to the Qatari authorities for having allowed its construction." Qatar's decision to allow open churches leaves Saudi Arabia as the only country in the region that doesn't allow the building of churches for any Christian denomination, or any open worship. The full article at the link above also has a couple photos of the church--both interior and exterior--which should be comment worthy to those who take an interest in church architecture. I couldn't really tell but it looks like they've installed folding chairs. I don't know the custom regarding seating, but whatever they choose is sure to set a precedent. BAGHDAD (AP) — A Chaldean Catholic archbishop found dead after a kidnapping was remembered Friday as a man of peace beloved by all Iraqis. Mourners carrying flowers and olive branches wept and wailed as Archbishop Paulos Faraj Rahho's coffin was carried down the streets of a village outside Mosul in northern Iraq. They were led by a church official carrying a wooden cross affixed with Rahho's picture. Rahho was kidnapped by unknown gunmen two weeks ago, just minutes after performing Mass in Mosul, al-Qaida's last urban stronghold. Three of his aides were killed during the kidnapping, one of many attacks on the country's tiny Christian minority since the 2003 U.S. invasion. His body was found Thursday. "He was a man of honesty, loyalty and peace," Cardinal Emmanuel III Delly told mourners. "He was loved by all Iraqi people regardless of their sectarian background." Rahho was the most senior Catholic cleric in Iraq after Delly — who was elevated to the College of Cardinals by Pope Benedict XVI in November. President Bush, the pope and Iraq's prime minister condemned Rahho's kidnapping, which U.S. officials in Baghdad called "one more savage attempt by a barbaric enemy to sow strife and discord." Since the U.S.-led invasion in 2003, Iraqi Christians have been targeted by Islamic extremists who label them "crusaders" loyal to U.S. troops. Militants have attacked churches, priests and businesses owned by Christians, many of whom have fled the country in a trend mirrored across the Islamic world. Although government officials both here and in Iraq are making a connection between Archbishop Rahho's death and the war, we should remember above all that Rahho was man of peace, as Cardinal Delly is quoted above as saying. It is indeed difficult to fathom the killing of an archbishop in any era, but in our era it serves only to point to other signs of the times. As we pause to join the Christians of Iraq at this difficult time, our prayers should be for world peace and for an end to the senseless violence and the evil, certainly the sin, of war. Friday arrives after a quick week with no shortage of news items to comment or reflect upon. This week was, for me, the official spring break away from work. Thus, it passed quicker than most. I also took the liberty not to blog for a couple days—although, I must admit that part of my Lenten observance this year has been to resume blogging after a lengthy period away from regular posting. Indeed it's been inspiring and I plan to continue on a regular basis, though with a day off here and there. As we move into Holy Week, I feel moved to consider the entire season of Lent in retrospect. If one might consider Lent to be a spiritual exercise, I would consider mine—though still looking forward to next week—to have been a success, at least in one or two aspects. As a convert, I have had to learn how to appreciate Lent—it didn't come to me at first. This year however, I think for the first time, Lent truly seemed to be the season of grace. Also, the idea of penance came home to me this year, and not so much individually though that's certainly part of it for all of us. The news this week seemed to be the best example I can give. Here it is Lent and a story breaks—partly erroneous—that the Vatican has declared new mortal sins to be added to the old list of sins. Interestingly, much of the world gets the opportunity this year to reflect on sin whether or not they were anticipating it. Even as late as Thursday evening I was still finding new reports of the same story. Among the many comments and so-called analysis I found a good bit of anti-Catholicism, both in the name of Christianity, as you will find by following this link, and in the name of godlessness, as you will find at this one. There were others as well, but I chose these two as examples because they represent the kinds of misinformation that show explicit opposition to Christ, one disguised as a pious criticism, and the other rather blatantly anti-Catholic. However, look also at the other news this week—the kidnapping and killing of the Chaldean Archbishop especially. Look at it in comparison to those who would dare criticize the Church for bringing attention to the broader sense of sin. While I haven't looked closely at comments regarding Archbishop Rahho's death, I wouldn't be too surprised to see the haters and trolls lurking nearby. In this regard I consider Jesus' words from today's gospel to be most relevant, "I have shown you many good works from my Father. For which of these are you trying to stone me?" These words of course speak for themselves and they teach us an important lesson. We know that the Church must undergo persecution. Yet most of us also realize that we live in a time that is like no other in history. The fact that I, a simple deacon and schoolteacher from Texas, can post my words for practically anyone in the world to read is proof of that. We live in a time of great change, great happenings, and of great sorrow also—the worst of which I fear has not yet come. However, there is a certain hope, which comes about from reflecting on sin. What comes to mind is that at each Mass, at the Penitential Rite, we reflect both on sin and on God's mercy toward us. Furthermore, in the rhythm of the liturgical year the season of penance is followed by the joy of Easter. The reflection and consideration of sin is conjoined by necessity, where there is contrition, with the experience of mercy and grace. Perhaps it's merely coincidental that something came up in the news that brought the idea of sin from the perspective of globalization to us. Perhaps it's a fluke that as this Lent draws to a close the entire world gets a wake-up call on the broader implications of sin. Nevertheless, I'm looking now for that which follows the reflection on sin—the proclamation, even the realization, of mercy and forgiveness. Indeed there has been a lot in the news this week—everything from Trinitarian baptism to the Templeton Prize. Catholicism has been getting a lot of attention lately, and as Easter approaches there will be more. It's a good time to be in prayer—rather than thinking of Lent as having been successful, it may be better to think of it as being fruitful. At least in terms of news there has been no shortage. While searching for follow-up information on a previous post concerning the Southern Baptist Convention making a statement on climate change, I found several stories claiming that the Vatican had redefined or revised the list of the seven deadly sins. The press was quick to pick up on pollution being part of the "new list." I found the post below, from the Acton Institute, to be helpful--at least in its links to relevant material on the story. “Recycle or go to Hell, warns Vatican”. “Vatican Increases List of Mortal Sins”, “Vatican lists ‘new sins’, including pollution”. These were three of the most sensationalist headlines in yesterday’s English-speaking press, picking up on an interview with a Vatican official published in L’Osservatore Romano on Sunday. Sometimes people do not understand the Church’s (issuing of) indulgences and Christian forgiveness? Why do you think it is that way? Today it seems that repentance is taken to mean opening one’s self to others when resolving issues found within his or her own special social sphere, within which one expresses his very own existence, and does so by offering his own contribution of clarification and support for those having such problems. Repentance, therefore, today takes on a (special) social dimension, due to the fact that relationships have grown weaker and more complicated because of globalization. In your opinion, what are the “new sins”? There are various areas today in which we adopt sinful behavior, as with individual and social rights. This is especially so in the field of bioethics where we cannot deny the existence of violations of fundamental rights of human nature – this occurs by way of experiments and genetic modifications, whose results we cannot easily predict or control. Another area, which indeed pertains to the social spectrum, is that of drug use, which weakens our minds and reduces our intelligence. As a result, many young people are left out of Church circles. Here’s another one: social and economic inequality, in the sense that the rich always seem to get richer, and the poor, poorer. This [phenomenon] feeds off an unsustainable form of social injustice and is related to environmental issues –which currently have much relevant interest. Anyone reading these passages can see that the Church is not proposing any new list of mortal sins, and certainly did not list “obscene wealth” and “pollution” as matters to be confessed by the faithful. The bishop simply referred to the social consequences of sin, some of which seem to be exacerbated by an increasingly inter-connected world. So how did the American and British press reports get it so wrong? Back in February 2007, John Allen of the National Catholic Reporter wrote an incisive piece about irresponsible reporting at the Vatican, and there is even an entire website, GetReligion.org, devoted to this problem. Having worked in the Vatican for several years, I know many of the beat reporters, including some of those who botched this social sin story. Most have absolutely no interest in the larger theological or philosophical issues discussed at high levels, so in a way this is all the fruit of culpable ignorance. But real damage is done to the Church and her flock by such slipshod reporting. Knowledge of Catholic social doctrine has surely suffered and people who may otherwise be interested in the Church have been driven away, all in the name of an eye-catching headline. Thankfully, not all the news is bad. Institutions such as the Pontifical University of the Holy Cross have started seminars to train journalists in reporting on the Church, though it seems not all the English-speaking ones in Rome have yet been able to attend. Sensational reports aside, environmental concerns are obviously part of what we must consider in terms of social responsibility. While there may be no need for individuals to confess sins such as "obscene wealth" and "pollution," we nevertheless are not excused from responsibility. I have found that certain Catholic bloggers prefer to treat global warming as if it were either nonexistent or a "green" political ruse. It's important to look beyond political polemics and begin to understand the real threats we face in our times. I find it refreshing to see that a Vatican statement on sin looks to the overall social responsibility that humanity has, rather than looking to sin as a purely personal phenomenon. However, each one of us must see himself or herself as a part of something greater. We must realize that our personal choices have a profound impact on the whole. It is time that we as individuals begin to demand change in our world, including prompt implementation of clean and renewable--even affordable--energy sources. The call is for humanity, as individuals and as a whole, to take responsibility for the world in which we live. We must demand change in that which left unchecked and to itself will destroy creation.